I might not like city breaks as much as I love holidays where I get to be at one with nature, but they can be a nice contrast every once in a while. Last year I went on a city break to Nantes in France and it was very pretty. I'm not a big city fan, I have to say, but the amazingly compact buildings you get in a city are like no other. 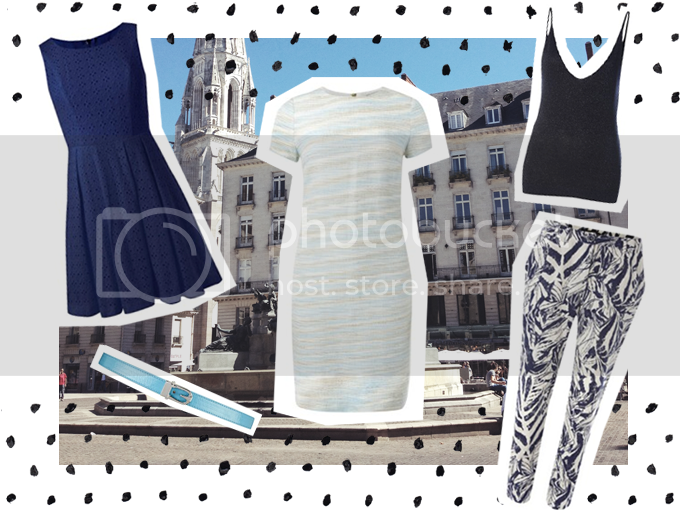 I've put together a collection of items I would take on holiday with me on a European city break. I especially love the light blue dress and the trousers. I'd wear the shift dress for swanning around art museums and the trousers for chilling in a cool cafe, or if I was feeling adventurous I'd wear them when exploring the city on a scooter. Are you going on any city breaks this year? What will you be packing? I'd so love to wear both of those dresses with that belt! They would all make such a cute look!